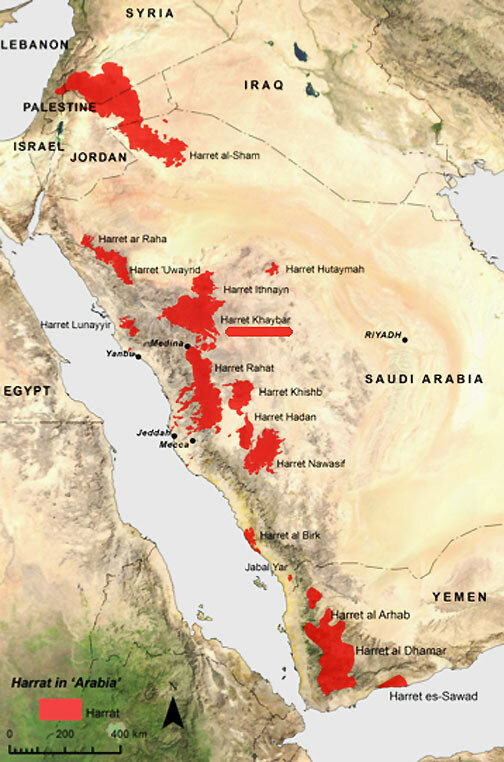 Mysterious patterns in lava rock of volcanic fields covering at least 15,000 square miles (40,000 square km) in southwestern Syria, Lebanon, Jordan, Saudi Arabia and Yemen (map below). 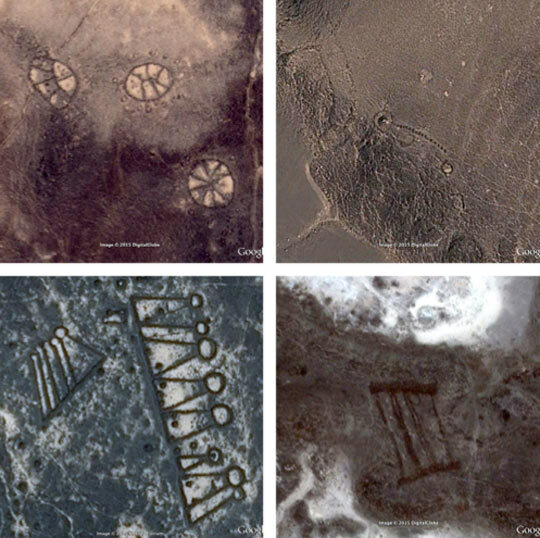 Upper left to right clockwise: thousands of circular "wheels," long bullseye "pendants," long rectangular "gates," triangular "keyhole burials." Below: Large lines of "kites" have also been found on Google Earth satellite images. Kites date to at least 8,500 years ago and one speculation is they were used to trap and hold animals. But even that concept is controversial among archaeologists who are stunned by the blanketing of harsh, uninhabited volcanic fields by so many strange patterns, some of which run for 7 kilometers, almost 5 miles, but are only two or three feet high. Images provided by Prof. David Kennedy, UWA. Kite found in Google Earth at lat/long 32.03.24.35 N by 37.59.34.90 E Altitude 1,336 feet. Another large kite found in Google Earth, but without lat/long and altitude information. Mysterious patterns in lava rock of volcanic fields covering at least 15,000 square miles (40,000 square km) in southwestern Syria, Lebanon, Jordan, Saudi Arabia and Yemen have been found on Google Earth satellite images in the red areas above. 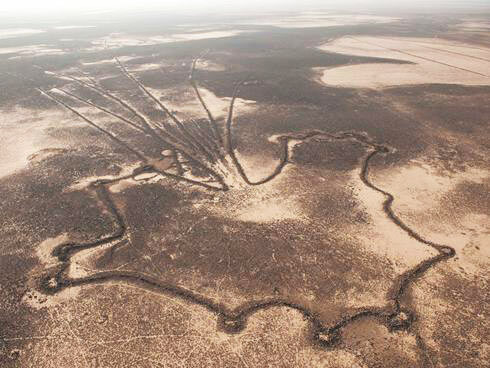 December 18, 2015 Perth, Australia - Scientists at the University of Western Australia working with Oxford University in England have taken more than 45,000 aerial images of mysterious landscape glyphs that were created between 2,000 and 9,000 years ago with intricate, precise and very different shapes. There are circular "wheels," long bullseye "pendants," triangular "keyholes," long rectangular "gates," and large "kites." 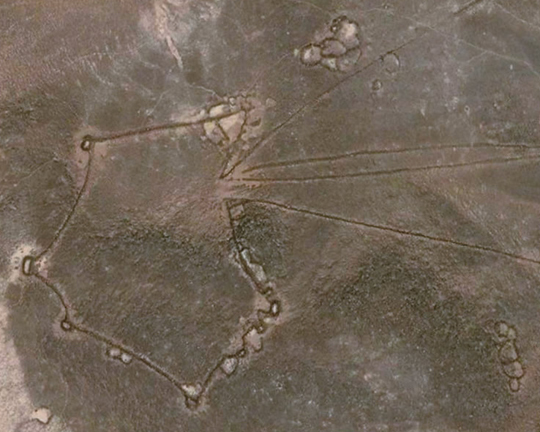 The patterns can only be seen from the air and the first people to report some of them in uninhabited lava beds were RAF pilots delivering mail from Cairo to Baghdad and India in 1921 after World War I. Previous PostPrevious Mysterious Granite Head On U. K.’s Isle of Portland. Next PostNext Part 2: Praying Mantis and Grey Beings – Allies? Or Foes?